Turn up the volume and see what two 8W drivers and two passive subwoofers can do. Unleash earth-shattering bass and get it all out, beat after beat, with the ultimate combo of aptX audio coding and Bluetooth 4.0 connectivity. Enjoy premium CD-quality audio. Enjoy a whole new music experience. Enjoy Yourself with the VAVA Voom20. Stop worrying about a little water splashing your speaker. Get the party going no matter where you are, whether that is at home, on the beach, and even by the glittering water of the swimming pool. The speaker's rubber-reinforced design and its IPX5 splash proof rating make it the best party companion in any situation. When Fun calls, VAVA is the answer. Imagine 8 hours of uninterrupted music streaming with the volume set at 80% of its maximum power. Imagine multiple parties in different places on a single charge. Well, VAVA made it real. The rechargeable 5200mAh lithium-ion battery has enough power to spare: besides partying all night, you can use it to power up your USB devices thanks to the built-in 5V/1A charging port. 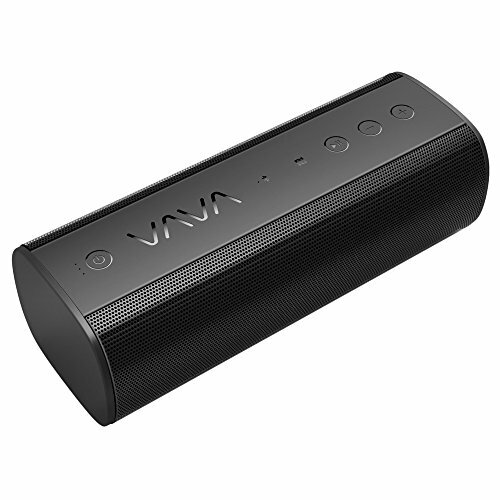 Whether it is via NFC, Bluetooth 4.0, or a conventional 3.5mm AUX audio cable, it'll be just as easy to connect the VAVA Voom20 and get the music pounding. If it is via Bluetooth connection you decide to go with, get ready to enjoy up to 2 devices paired at once and the possibility to seamlessly switch from one to the other at will. Free the DJ inside you and AWE the fun out of your friends. If you have any questions about this product by VAVA, contact us by completing and submitting the form below. If you are looking for a specif part number, please include it with your message.